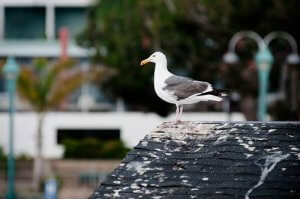 You are here: Home / Roof Leak / How Can Bird Droppings Cause Damages to Your Roof? The excretion of nitrogenous waste produces uric acid which is seen in the form of white spots on the surfaces. This uric acid can erode the asphalt shingles and roofing materials. It can make your roof prone to the leakages. Sometimes, the birds congregate in certain areas. This area of the roof will be covered with more bird droppings. It can be detrimental not only to the roofing but also to the structure of your home. You should use a strong garden hose to wash away these droppings. Preferably, hire Santex roofing in San Antonio for inspecting the areas of concern and repairing the damaged parts immediately. The birds ingest seeds that sometimes remain intact and are excreted in the droppings. They can grow using the water and leaves in your gutters. This results in clogging of gutters due to which water gets accumulated and backed up into the roof. This water will create an ice dam during winters and cause further damage to the roofing materials and your house. You should regularly inspect the gutters and remove the clogs. For severe problems, hire the experts. The bird droppings contain organisms and fungus that may be carried to the air. It can cause severe lung problems for your family. A regular inspection of the roof and gutters by an experienced roofing company San Antonio can help in mitigating all these risks.